“Talented and engaging,” “charismatic and exciting,” “energetic and intelligent,” “conductor who orchestrates with complete confidence and attention” – these are some of the statements used by the press to describe Maxim Eshkenazy. 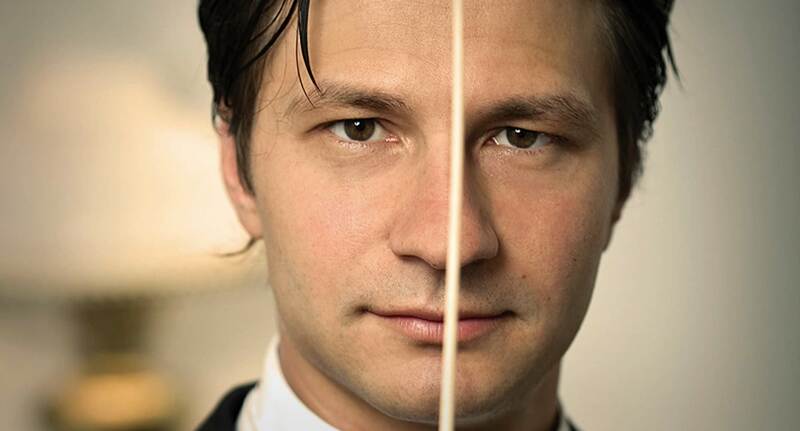 Defined as a rising star in the contemporary generation of young conductors, Maxim strives to bring larger audiences to the music halls and promote the values of orchestral music. Maxim Eshkenazy was born in Sofia, Bulgaria in a family of musicians. He started playing the violin at an early age and graduated from the “L. Pipkov” National Music School and the “Pancho Vladigerov” National Music Academy in Sofia. After winning a scholarship, he continued his education at the University of Southern California’s Thornton School of Music, where he completed two Master degrees in Violin Performance and Orchestral Conducting. He studied conducting with Hans Bauer, Sergiu Comissiona, and in the Pierre Monteux School in Maine. He has also attended numerous master classes and worked with world renowned conductors such as Pierre Boulez, Esa-Pekka Salonen, Zubin Mehta, Kent Nagano and Michael Tilson-Thomas. In the summer of 2000, Maxim Eshkenazy was awarded a fellowship from the American Academy of Conducting at the Aspen Music Festival. Maestro Eshkenazy lives in Los Angeles and dedicates much of his time to working with young musicians. Deeply committed to teaching, he leads several youth orchestras in Southern California with the purpose of enabling young people to gain orchestral experience and savor the unique feeling of orchestral music-making. Maxim works at The Colburn School, where he is currently Music Director and Conductor of the Colburn Community School’s Colburn Chamber Orchestra and Colburn Youth Orchestra, as well as Assistant Conductor of the Colburn Conservatory’s orchestra. Under his leadership, the Colburn Conservatory Orchestra performed a series of concerts during a 2010 tour in his native Bulgaria. Maxim is also Music Director and Conductor of the Youth Symphony Orchestra of Bakersfield, which in 2011 carried out an extremely successful tour in South Korea. Additionally, he is Music Director of the Irvine Classical Players Orchestra & Seraphim Symphony, which in 2012 performed a concert tour in the UK – London, Edinburgh, Bristol and Oxford. Maxim has also been guest conductor of the New West Symphony, the Huntsville Symphony Orchestra in Alabama, the Sibelius Orchestra and the National Symphony Orchestra of Costa Rica. Maxim has also served as Music Director of the Pasadena Youth Orchestra and Music of Changes Chamber Orchestra. He was also Assistant Conductor of the American Youth Symphony Orchestra and Zipper Chamber Orchestra. From 2008-2013 he was Music Director of the Pacific Symphony Youth Orchestra, which in 2011 performed a concert tour in Bulgaria’s biggest cities – Sofia, Varna and Plovdiv – that was documented by PBS. Five years under the leadership of Mr. Eshkenazy, the orchestra rose to its current artistic level and enriched its repertoire to that point that it won the highly prestigious “Youth Orchestra of the Year” Award from the Classics Alive Foundation in 2012. During that time, he also served as Assistant Conductor to the Pacific Symphony, where for the period of five years he conducted its educational concerts and implemented numerous projects and premieres of contemporary works. Maestro Eshkenazy has a special relationship with contemporary music. As Music Director of the Music of Changes Chamber Orchestra, he was involved in numerous performances and premieres of new works. He regularly included in the program works by composers such as George Andreev, Jim Self, Steve Miller, James Taylor and Sandor Veress. He has paid meticulous attention to the premiere of American and Bulgarian works derived from non-orchestral genres; Bulgarian folk melodies, Ethno Jazz, film music and modern interpretations of orchestral music. As conductor of the Pacific Symphony, Maestro Eshkenazy has generated memorable cross-genre performances including the Nutcracker, Tchaikovsky Spectacular, Cirque de la Symphonie and the “Dvořák in America” project. In addition to his commitment to conducting, Maxim continues to play the violin and is a member of the Hermes Piano Trio, which frequently participates in performances and recordings. Maxim has worked with artists such as Midori, Pinchas Zukerman, Shlomo Mintz, Sarah Chang, Joshua Bell and Yo-Yo Ma. Maestro Eshkenazy divides his time between numerous engagements in the U.S. and Bulgaria. He is among the most popular guest conductors of the Sofia Philharmonic Orchestra, Philharmonic Orchestra of the National Radio, Classic – FM Band, Pleven Symphonic Orchestra and orchestras of the opera houses in Stara Zagora, Varna and Burgas. In 2010, Maxim founded Fortissimo Fest, a festival for classical music that builds a bridge between the culture of Bulgaria and the United States and presents the richness of classical music for the wider audience. Every year since then, more than 10,000 people have the opportunity to get in touch with Maxim’s beloved art form at outdoor concerts in the largest cities of the country. After the extraordinary success of the festival, Maestro Eshkenazy created the Fortissimo in Class program, which focuses on bringing professional musicians into more than thirty schools throughout the country in order to familiarize children with musical instruments and the gift of classical music. And in 2012 Maxim launched a new program, Fortissimo Family, which presents family-friendly concerts and is currently enjoying great popularity. Maestro Eshkenazy’s generous initiatives in Bulgaria have brought him increasing recognition and distinction in his native country, where he is highly regarded and held in great esteem.